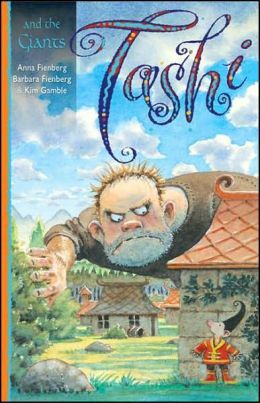 First reviewed on 9/6/10, the Tashi books came into our lives at just the right time. My youngest was on the verge of learning to read and these books were the perfect in every way - length, difficulty, excellent stories and superb illustrations. We were all hooked! My husband and I ended up reading all 16 books out loud to our son, whowent on to read them on his own. The Tashi Series originates from Australia and when I first reviewed these books it was not easy to come by all 16 of them. Things have changed! Your best bet is to purchase THE GREAT BIG ENORMOUS BOOK OF TASHI for $24.99 - often discounted. Each individual chapter book, rich with color illustrations, has two stories in it and costs $5.99. Thus this book with 32 stories includes the text of all 16 books and is probably pretty hefty in size and weight. For $44.99 you can purchase Tashi: The Complete Collection, a boxed set of all 16 books that is more manageable for little hands. 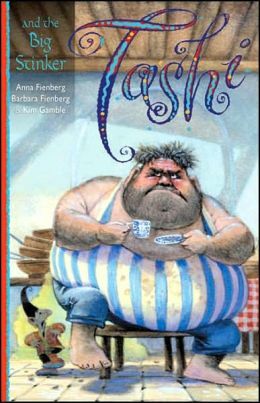 Before I write anything about Tashi , written by Anna Fienberg, Barbara Feinberg and illustrated by Kim Gamble, I need to thank YNL (Your Neighborhood Librian) over at Pink Me for reviewing this book. It has sparked a whole new level of interest and excitement in bedtime reading for my youngest child and me! But first, let me tell you what this fabulous series is about. As Australian Anna Fienberg says of her mother, Barbara, "when she was a child, she used to tell whoppers. Creative fibs. Tall stories. And kids would crowd around, dying to hear the latest tale. We talked about a character like her - someone who told fantastic stories - and over many cups of tea we cooked up Tashi." And what stories they are! 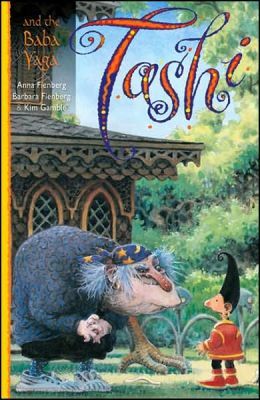 The authors take magical, mythical characters from storytelling lore like the Golem, the Phoenix, the witch Baba Yaga, dragons and a Genie and put them up against the clever, brave, bold Tashi. Tashi also encounters forbidden rooms, ghosts, white tigers, bandits, demons, spells, a warlord and a lost city. But, what really makes these stories special - and enthralling - is the framework that the authors set them in. The first Tashi story begins with a young boy telling his parents about his new friend as they eat dinner. When Jack tells his parents that his new friend is from a place very far away and he came here on a swan, his father asks, "A black or white swan?" "It doesn't matter, you always ask the wrong questions!" Jack replies. This dynamic carries on between the father and son for more than a few stories and, as a parent I find it very funny. I think for the kids it helps build tension. Mum, however, seems to always have the right responses and ask the right questions. Jack proceeds to tell them the story of how Tashi was sold to a warlord but escaped by flying from his country to Jack's on the back of a goose. When the warlord tracked him down, the goose helped him trick the warlord and escape. Some of the Tashi stories begin with Jack re-telling a story Tashi has told him, while other stories find Jack and Tashi playing together in the backyard, sitting in the pepper tree or riding a ferry when Tashi is reminded of another story to tell Jack. Either way, someone always says they sense a story coming on, and, after reading about 10 of these stories my son even knows when to anticipate a Tashi tale! 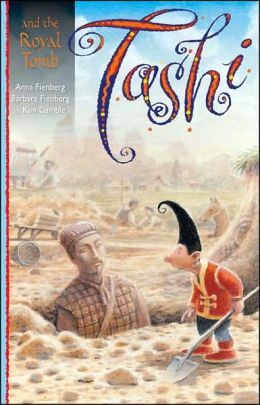 Another aspect of the Tashi books that I really like is the Asian feel that the stories and illustrations have to them, reflecting perhaps the native Aboriginals and Southeast Asian neighbors' influence on Australian culture. The houses have pagoda-like roofs and characters have names like Uncle Tiki Pu, Li Tam and Chintu. The feudal, slightly medieval setting for Tashi's homeland also adds to the foreignness and magical tone of the stories. And, there is a MAP of Tashi's Village and Surrounds that takes up the first two pages of the book!! As best I can tell, there are sixteen Tashi books currently in print, each one containing 2 stories. The individual books are about $5.99 each, comparable to a Magic Treehouse book, but a slightly easier read. Fortunately for us, there are TWO Tashi omnibuses, each very reasonably priced around $16.00. The Big Big Big Book of Tashi contains 7 books and 14 stories. The 2nd Big Big Book of Tashi contains 5 books and 10 stories. If these prices seem a bit high, please bear in mind that they are published in Australia and imported to the States. This is also why there is a pretty good chance you will have to order these books, which, if you have any boys at home under the age of eight, I HIGHLY recommend you do. And, if your kids really love Tashi, there is a new activity book which can be purchased in the States as well! 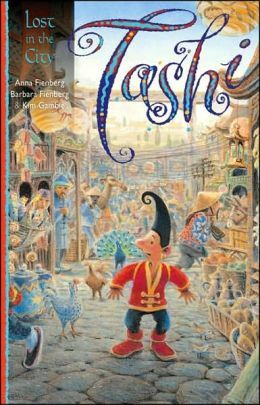 There are a few Tashi books that can't be purchased here, however, including the full color picture book, There Once Was a Boy Called Tashi. I would LOVE to get my hands on this book! Kim Gamble's illustrations are wonderful - rich with colors and lush with details, they strike the perfect gentle balance with the mean, scary villains in the stories. They are perfectly matched with the stories and are what drew me to these books instantly. So here is my story, why I love Tashi so much. I have a shameful confession to make. I do not read out loud to my youngest every day and haven't for a while. I work more than I ever did when my two older kids were little, plus I spend a fair bit of time blogging and, on top of it all, I am old and tired. So, Griffin falls asleep in front of the television most nights. But, with the start of kindergarten I decided to scape up the last bits of energy I had and make a change. Fortunately for both of us, this is when Tashi came along. Bedtime reading most nights meant the same old well loved, falling apart Richard Scarry books from my childhood or the occasional foray into a chapter book that we quickly lost interest in because we weren't reading it every night, or because I had already read it twice to my two older kids. Occasionally I'd throw in a new picture book or two, but, as wonderful as picture books are, there is something truly magical about a bedtime story that keeps you on the hook waiting for the next night's installment. And Tashi is definitely that kind of book! On top of that, it is a excellent book for tired old folks like me because each story is around 20 pages long with illustrations on every page and can be read in 5 - 10 minutes, which is about all I can hold out before falling asleep! In fact, although it is only 4 o'clock on a Saturday afternoon, my son has discovered me sitting in bed with the Tashi books next to me for reference as I write this review and has asked if we could read a story right now. So, I will stop here to read Tashi and the Baba Yaga! The 16 book boxed set. 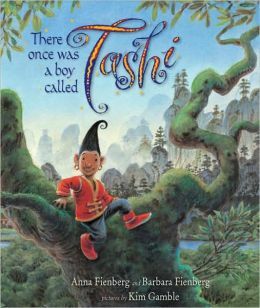 There Once Was a Boy Called Tashi, the picture book and The Amazing Tashi Activity Book!! I showed this to my 4-year-old and he can't wait to go to the library to get these. Thanks for the review! Interesting! I've had these books home several times from the library, and the kids never pick them up -- I don't know why, as the covers are cool, and they're not a daunting length. Maybe the key (as you've found) is to try them as read-alouds -- I'll attempt it when we're done our multi-month-Harry-Potter-bedtime marathon. Holly - Hope you two love these stories as much as we do! If your son gets frightened easily, skim ahead and look at the pictures. We haven't encountered anything too worrisome yet - most baddies & monsters look a bit silly. However, we just read a story with two scary-ish demons in it. Tanya I am so glad you and Griffin are enjoying Tashi! There is an old-fashioned episodic pace to them that really works for kids that age. In the same vein, I also recommend the Jenny and the Cat Club books, Nurse Matilda, and good old Frog and Toad! thanks for the tips!! We love Frog & Toad already, but I haven't cracked Jenny & The Cat Club since I was a kid. Will definitely read that together and look for Nurse Matilda - that's a new one for us.